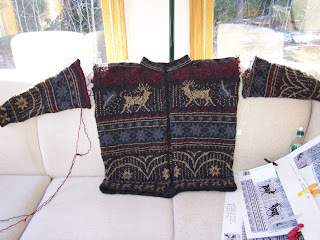 Facings on the body of the Dale of Norway Hemsdale cardigan are made and all sewn down. I'm glad the decision was made to use loops for the buttons instead of buttonholes. 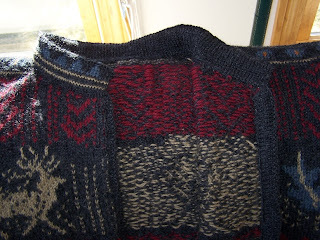 That is one thick front face with the front edge and steek stitches all covered over by a knit strip in the back. Doubt the button holes would have lined up anyway. The front doesn't look like the motifs line up but they do. Sleeves are close to done except for their turn under facing. Might wait until next week to see if this sweater fits my taller daughter. If so, will knit the sleeves to fit her much longer arms and gift the sweater. She lives in NC and could always use it on a rare cold winter day for a coat. All is ready to knit "Erin" along with the rest of the KAL and see how my color substitutions work out in Jamieson and Smith. I've wanted to make this one for a long time. Picked up a good Addi US #2 1/2 circular to try a swatch. I know I get 7 to 7.2 stitches to an inch in J&S on US #3 after washing and blocking tightly. I'd like to get closer to the 8 stitches to an inch gauge called for since I don't want to swim in this sweater. 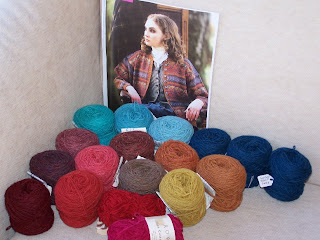 Pretty colors and who knows if I'll actually use the chenilles or not. It's beautiful! Looks extremely warm. It will be lovely, I have the kit too, ready to be kbitted !!! Very attractive. Colours and patetrn. Looking forward to seeing the finished garment. Anne- Definfitely not a quick knit- but amazing results. Great job. Looking forward to seeing Erin. WOW!!! What beautiful knitting you do! I do not have the patience or the time to do something like this!!! I wish someone would gift me with a sweater like this! But, alas, none of my friends are knitters...wishing they were...lol. Your Hemsdale is beautiful and I love your Erin project. It will be a pleasure to follow your work.